Nursing is a profession with independent practice which focuses on holistic client care. A nurse plays a clinical role among other roles in promoting and maintaining the health of the individual and family within the community. To achieve this goal of nursing, there is need for an organized framework or sequence of problem solving steps that guides nursing practice. Nursing process is an organised framework for professional nursing practice (Ackley and Ladwig 2011). American Nurses Association 2007 defined nursing process as an organized sequence of problem-solving steps used to identify and manage the potential and actual health problems of clients. Nwonu (2002) defined Nursing Process as a systematic and goal directed set of activities which are interrelated and dynamic, used by the nurse to determine, plan and implement individualized nursing care which is aimed at helping the patient achieve integration of his whole being or optimal level of wellness. § Goal directed set of Activities. § Determine, plan and implement. § Integration of a whole being/optimal level of wellness. 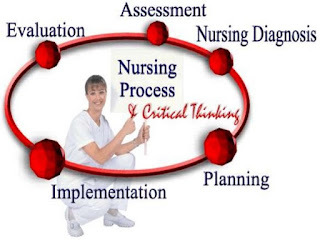 § Nursing process is systematic and organized with specific components. § Nursing process is cyclic, with each phase leading logically to the next. Each phase is dependent on the accuracy of the preceding one. Each step overlaps with the previous and subsequent step. § It is purposeful and goal-directed. The goal is to provide quality, individualized, client-centered care. § It is dynamic to meet the ever changing needs of the client. § It is interactive because it involves reciprocal interpersonal relationships between the nurse and the client, family, significant others and other health team members. § Nursing process is theoretically based as it is grounded in knowledge of sciences and humanities. There are some theories that are applicable to Nursing process some of which are Gordon Marjorie’s functional health pattern model which applies to assessment phase; Maslow’s hierarchy of need theory which applies to planning phase etc. The nurse must incorporate knowledge from many areas in order to deliver holistic care, that is, to meet the total needs of the client. § Nursing process is flexible and can be used effectively in all levels of health care setting. It is appropriate for use with individual clients, families, groups, or communities. It can be used with the acutely or chronically ill patients. Nurses can utilize the nursing process with clients of any age and at any developmental level. This is the first phase in the nursing process. It is a time of data collection or information gathering about the individual patient, family or community. Data gathering include physiological, socio-cultural and environmental information about the patient, family or community. Information gathered is verified, organized, interpreted, and documented. The completeness and correctness of the information obtained during assessment are directly related to the accuracy of the steps that follow. Assessment provides information that could be subjective or objective which forms the client database. Subjective data are data from the client’s point of view and include feelings, perceptions, and concerns. The patient’s history, embodying a personal perspective of problems and strength, provides subjective date (Ralph & Taylor, 2011). It is an essential data source in the assessment phase. Objective data are observable and measurable data that are obtained through both standard assessment techniques performed during the physical examination and diagnostic tests. The primary source of data is the client. The client is an individual, family, community or group/organization. Secondary source: physical examination, nursing history, team members, laboratory reports, diagnostic tests. - History taking (client interview). - Review of relevant documents/reports. - Diagnostic and laboratory investigation. This is one of the major tools the nurse uses in nursing assessment. It provides the necessary information from which to develop a written record about the client and identify existing and potential problems of the client. It allows the nurse to plan and modify nursing actions in accordance with the client’s desires, values and patterns of daily living. - Initial complete history - Enough information is gathered by the nurse to assess the general health status of the patient as an individual. It serves as the basis for future comparison. - A health complaint history or emergency history – it focuses on immediate problem, events that led to the problems, home or emergency treatment and its effect. - Update or interim or time lapse history – it focuses on health a problem that arises after the clients’ last contact the nurse. - Introduction phase or join phase. The nurse and patient establish rapport and trust in this phase. Identification data such as name, age, address, marital status, religion, educational status, etc are obtained. This phase helps in forming a base for continued rapport necessary for a good directed interaction. Information related to history and assessment of the patient’s problem is collected. This focuses on the closure of the interview. Summarizes the discussion so that the client can validate the nurse’s perception of what has occurred and decisions made. Physical examination constitutes objective data that is observable or measurable and can be verified by more than one person. It helps the nurse to validate the client’s complaints/information got during history taking. The data are obtained using senses of touch, smell, vision and hearing (Nwonu, 2002). The relevant reports and records include x-ray reports, admission records, ultrasound reports. Tests like haemoglobin, pack cell volume estimation (PCV), blood grouping, and routine urinalysis can be ordered by the nurse to form baseline data. The nurse should know the normal values in order to identify deviations from the normal. 1. Initial assessment: this is performed shortly after patient’s admission to a health facility. 2. Problem focused assessment: in this case, the nurse gathers data about a specific problem that has already been identified. 3. Emergency assessment: Here the nurse performs emergency assessment on a physiological or psychological crisis to identify the life threatening problems. It focuses on the few essential health patterns and is not comprehensive. According to Nwonu (2002), Nursing Diagnosis is a concluding statement based on the analysis and interpretation of systematically collected data, describing the actual or potential health problems or the client’s response to these for which the professional nurse is qualified and licensed to intervene. Nursing diagnosis is a clinical judgment about individuals, family, or community responses to actual or potential health problems/life processes (Herdman, 2012). There are four types of nursing diagnosis. 1. Problem focused diagnosis (this was formerly called Actual diagnosis) – this is a clinical judgment concerning an undesirable human response to a health condition / life processes that exist in an individual, family, group and community (Herdman ad Kamitsuru, 2014). The problem focused diagnosis has a label, definition, defining characteristics and related factors. Example. Definition – Inspiration and /or expiration that does not provide adequate ventilation. 2. Risk diagnosis– This is a clinical judgment concerning the vulnerability of an individual, family, group and community for developing an undesirable human response to a health condition / life processed (Herdman and Kamitsuru, 2014). Risk diagnosis has a label, definition and related factors but no defining characteristics. 3. Health promotion diagnosis: This is a clinical judgment concerning motivation and desire to increase well being and to actualize human health potential. These responses are expressed by a readiness to enhance specific health behaviours, and can be used in any health state. Health promotion responses may exist in an individual, family, group or community. (Herdman and Kamitsuru, 2014). The health promotion diagnosis has a label, definition and defining characteristics to establish the positive health behaviours. It does not have related factors. Definition: Is a pattern of community activities for adaptation and problem solving for meeting the demands or needs of the community, which can be strengthened. 4. Syndrome diagnosis: this is a clinical judgment concerning a specific cluster of nursing diagnosis that occur together and are best addressed together and through similar interventions (Herdman and Kamitsuru, 2014). It si a problem focused diagnosis. It has a label, definition, defining characteristics and related factors. Definition: Sustained maladaptive response to a forced, violent, sexual penetration against the victim’s will and consent. After the appropriate priority of nursing diagnoses is determined, outcomes are developed. In the opinion of Moorehead, Johnson and Maas (2004), outcomes are variable concepts that can be measured along a continuum, which means the outcomes are stated as concepts that reflect a patient, family caregiver, or community actual state rather than expected goals. Development of outcomes can be done through two ways: using the Nursing Outcome Classification (NOC) or writing an outcome statement ((Ackley & Ladwig, 2006). Using NOC- Outcome (Hope.) Mobility. Patient’s physical mobility will improve within the period of hospitalization. The outcome criteria are specific conditions under which the outcomes are expected to occur. Outcome identification can be short term or long term goal. According to Nwonu (2002), planning is the act of determining things to do to ensure that client is assisted to achieve restoration, maintenance and promotion of health. Planning promotes continuity of care. For planning to be effective, individuals, families and communities has to be involved.  Setting priority – Here the diagnoses are arranged in order of importance taking into consideration the life-threatening needs, health-threatening needs and patient’s concerns. Maslow’s need theory is useful in prioritizing diagnoses.  Setting objectives – The objectives should be client centred, stating what the client should be able to do or exhibit by the end of nursing intervention. They should be measureable, achievable and time bound.  Selecting appropriate nursing intervention – Nursing interventions that will assist the client to achieve the set objectives should be selected taking into consideration the client’s preferences.  Writing a care plan – All the actions in the preceding three steps are pooled and written as a care plan that should guide the implementation of care. The use of standardized nursing language is important in writing a nursing care plan. The relevant standardized languages here are NOC and NIC. The Nursing Outcomes Classification describes an individual, care-giver, family, or community state, behaviour or perception that is measured along a continuum in response to a nursing intervention(s) (Moorhead, Johnson, Mass and Swanson, 2013). It is also a comprehensive, standardized classification of patient/client outcomes developed to evaluate the effects of nursing interventions. Each NOC outcome has a label name, a definition, a list of indicators to evaluate the patient current status in relation to the outcome, a five-point Likert scale to measure patient status. Each NOC has: Label name: Community Risk Control: Unhealthy cultural traditions. Definition: Community actions to promote customs, beliefs, values and laws that support members’ health and lifestyle modifications within the culture. Measurement scale(s): 1 (poor) 2 (fair) 3 (good) 4 (very good) and 5 (excellent). The nurse rates the client using the indicators listed below on this measurement scale at every stage to evaluate progress. Each NIC has label, definition and the activities to be performed by the nurse. Definition: Thermometric reading above normal body temperature of 37.20c. · Give prescribed antipyretic drug. · Means putting nursing care plan into ACTION! · To help client attain goals and achieve optimal level of health. · Requires: Knowledge, Technical skills, Communication skills. · During implementation, all the previous phases of the nursing process are integrated. · While giving the actual care, you must continue to assess, validate concerns, modify the plan and identify priorities as needed. · The nursing interventions should be client-centred and goal-oriented; with careful attention to the safety needs of the client. · It is important to ensure active involvement of the client and family while implementing care. · During delivery of care, the nurse should continue to assess the behaviours of the client while giving nursing care. Evaluation in nursing process is the planned, systematic comparison of the client’s health status with the goals/expected outcomes. It is an ongoing activity, done on a day -to-day basis, which involves the client, the nurse, and other health team members. It is an on-going activity and involves the client, the nurse and other members of the team. Nursing Outcome Classification should be used as guide when writing evaluation. · Determining the client’s progress toward achievement of the stated goals/expected outcomes. · Judging the effectiveness of the nursing orders, strategies, and care plan. N: B-Expected outcomes identify the exact client behaviors to be achieved. · The goal was completely met. · The goal was partially met. · The goal was completely unmet. When a goal is partially met or not met, the nurse reassesses the situation. Definition: – Inspiration and /or expiration that does not provide adequate ventilation. Adjust intake to optimize fluid balance. Ackley, B. J. & Ladwig, G. B. (2011). Nursing Diagnosis Handbook: A Guide to Planning Care. Phildelphia: Mosby-Elsevier. Bulechek, G.M.,Butcher, H.K.Dochterman, J.M. & Wagner, C.(2013). Nursing Interventions Classification (NIC), 6th Ed; Canada: Elservier. Herdman, T.H. & Kamitsuru, S. (2014). North American Nursing Diagnosis Association-International. Nursing diagnoses: Definitions and classification, 10th Ed; Chichester: Wiley-Blackwell. NANDA –I (2013): NANDA International Nursing Diagnosis Glossary available from http://www.nanda.org/nanda-international-glossary-of-terms.html. Accessed 24th March 2017.